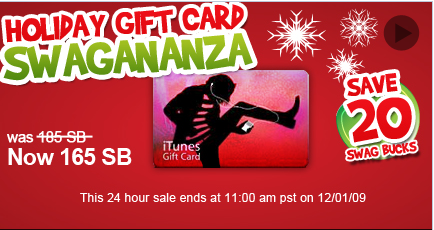 Okay Swagbucks junkies….Today’s gift card blowout is for iTunes. The card has been reduced to 165 SB for a $15 card (orgianally 185 SB). Go here to check it out. Not sure what Swagbucks are? Check it out here or go here to learn how I plan on paying for Christmas with Swagbucks.